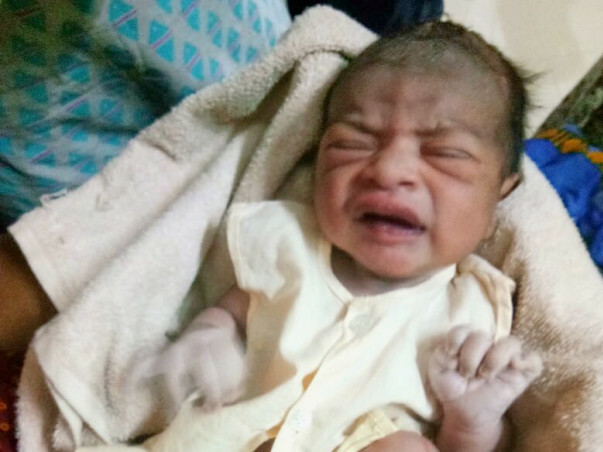 Pavithra's 10 day old baby boy [MRD No.712446] was admitted in the Kanchi Kamakoti Child Trust Hospital with concerns of seizures, sepsis and was later found to have intestinal perforation with necrosis. The baby underwent surgery following which a colostomy has been done. He needs to be supported with parenteral nutrition and antibiotics. The baby hails from a financially underprivileged background. The treatment cost for this baby is Rs.1,25,000/= so far, excluding medicines, against which the parents have paid Rs.60000/=. 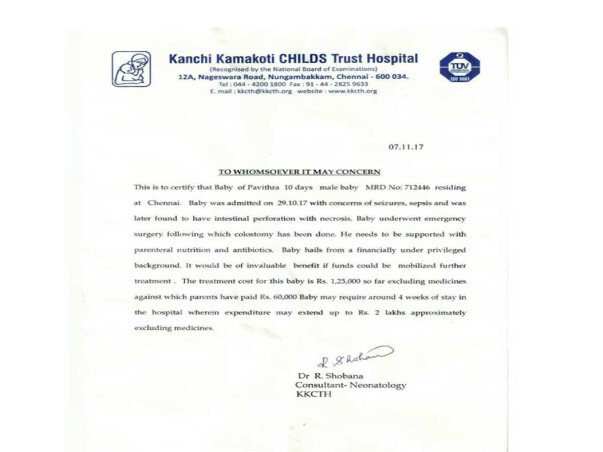 The baby may require around 4 weeks of stay in the hospital wherein the expenditure may extend up to Rs.2 ,00,000/= approximately excluding the medicines. Your contribution will be greatly appreciated. 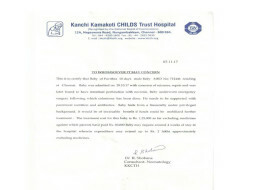 The baby is better and has put on weight and is fit to undergo the surgery to close the colostomy. The surgery is scheduled to take place on January 5, 2018. We thank all the donors and pray that the baby recovers soon. Please pray for the baby and his speedy recovery. 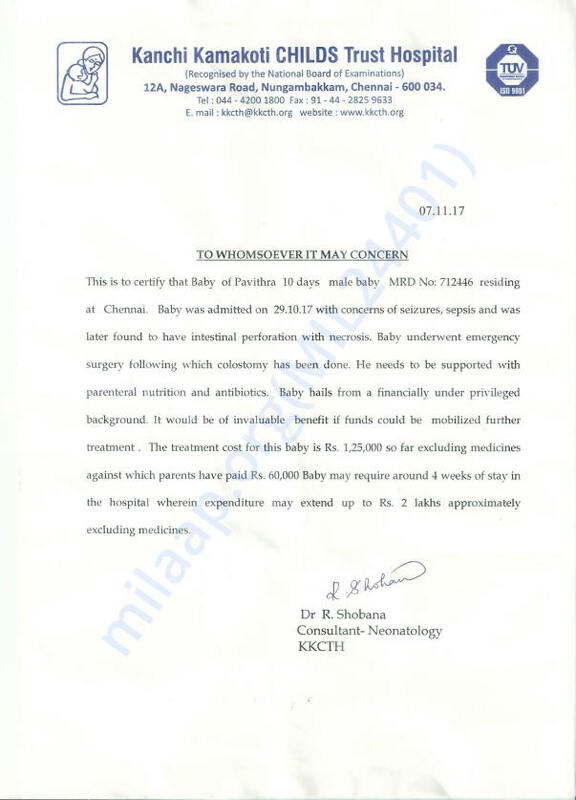 Here is an update on Pavithra's baby. Pavithra's baby is going for regular check-ups and is recovering well. He is gaining weight. Depending on the progress a surgery will be performed to close the colostomy in a few months time. The parents of the baby boy and we at World Care Way are very grateful to all the donors for their timely & generous contributions and prayers. The baby is recovering and has been discharged. The baby is able to tolerate milk and learning to feed by mouth. He has to visit the hospital for periodic check-ups to treat the post surgery wound. After monitoring the progress of the baby another surgery has to be performed in a few months time to close the colostomy.